This is an article I wrote for my profile on Tutor Pages. As you are likely to know if you are reading this, the grading for GCSE has been changing, with the new method phased in between 2017 and 2019. Maths, my subject, was one of the first to ‘move over’ to the grades from 9 to 1 from A to G.
Unless a tutor has worked in schools during this period and so picked up on training there, he or she needs to do some homework on the changes. I don’t claim to have done all the work I need to on this, but I thought I would share some observations on how exam questions have changed, specifically in Maths. The change from letters to numbers is not just cosmetic. The distribution of the grades will be different. Under the old system, grades A to C were considered as the old fashioned ‘pass’. When I took my GCSE course in the 1980s, this was shortly after the GCSE qualification had been created from a merger of GCE and CSE. My lecturers on that course were keen to say that all ‘letters’ were a sign of attainment – a student who gained a D had found some level of success – but the idea that one should ‘pass’ – and that A, B and C were the pass grades – persisted. It’s commonly held that you ‘have a GCSE’ if you attained C or higher. I’m not saying that is good or bad, but I was sure this would happen even while being told otherwise by my lecturers. A notable feature of the 9 to 1 system is there are more pass grades. A grade 4 or above will be considered a ‘pass’ – which is not to say that a pass will be easier to achieve. A 4 will be roughly equivalent to a C, though the grade boundaries are not exactly the same. It’s at the top end that the change is greatest, with a 7, 8 or 9 all corresponding to an A/A* grade, and differentiation between the brighter students that provides the reasoning behind the change. For this to be achieved there needs to be an increase in the number of truly challenging questions on exam papers. There will be more questions that students targeting a respectable 4, 5 or 6 will find it difficult to attempt. There is also a different style of question even in the 4/5/6 range of question that will reward not only hard working ‘book workers’ but encourage a depth of understanding and problem solving skills. Does this make the exams harder? Arguably so. But if prepared for properly by educators, will raise the level of ability as related to grade. I’d like to look at a few examples to support my point – though I’ll add here as an aside, for the non school based tutor, the change has the unwanted side effect that we won’t have the bank of old paper to use. This will of course, improve with time. Exams tend to be made available 15 months or so after they are ‘live’, and some boards have published free samples. Calculation of surface area and volume isn’t the simplest subject area on the GCSE Maths syllabus, but neither is it the most complex. 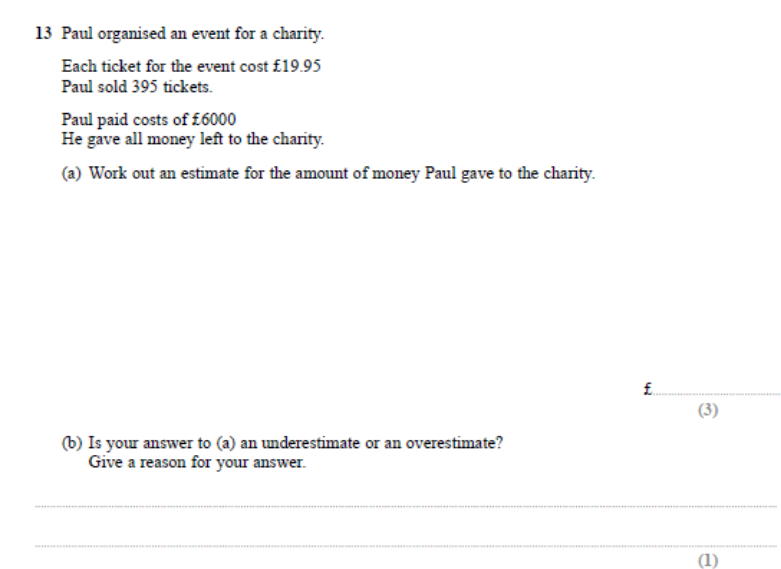 But this question really tests the exam takers reasoning powers. 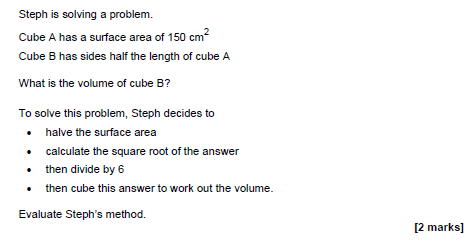 On the old A-G papers, this might have been ‘Find the volume of a cube with surface area 150cm2’. This question puts the student in a new role, which might be unfamiliar if their tutor has not prepared well. This is another question designed to strech the student. The three marks for part a can be earnt by understanding how to estimate. The extra mark requires an understanding of exactly what they did in part a. It’s a deeper level of knowledge, and shows that grades 8 and 9 are there if one is truly at home with numbers. I have found my able Year 10 student lapped this up – but for a student aiming for a 4 to 6 grade, I’d probably leave this alone.